Sutter Creek is named after a local creek, which in turn got its name from a local prospector, John Sutter, who discovered gold nearby in 1848, triggering the California Gold Rush. Sutter owned a sawmill where the mother lode was found, and after fortune hunters began trampling his land, he decided to prospect, too, moving to Sutter Creek to begin his own mining operation, using his servants to mine, something that drew the disapproval of the miners also working to find gold. Eventually, he returned to Sutter’s Fort in Sacramento and never mined again. By 1852, Sutter Creek had a post office. Two years later, it was a town. In 1913, it incorporated. Over time, the town became a boomtown, moving from gold mining to quartz mining until 1942, when most of the gold mines were closed during the war. In 1865, disaster struck the town of Sutter Creek when fire ravaged the business district, burning the American House Hotel to the ground. 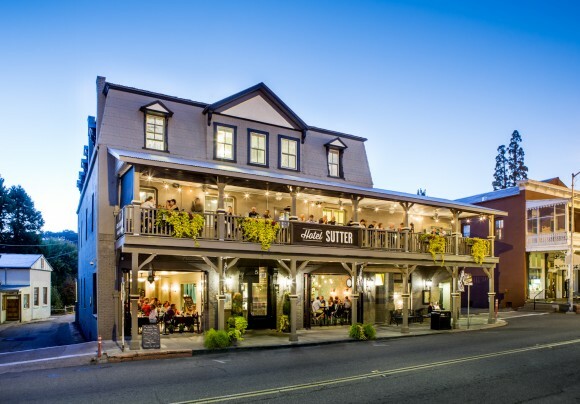 It was rebuilt, and went through several name changes — the American Exchange Hotel, the Belotti Inn, and now the Hotel Sutter.